I’ve been seeing different versions of this recipe all over lately. (And I may have made it three different times this week to give as gifts.) But after following recipes the first two times and doing slight variations with crushing the crackers(makes it harder to spread stuff over later), different amounts of white and brown sugar(didn’t notice a difference) and cooking on the stove top, I decided that I wanted less bowls/pots/utensils to wash and less time standing at the stove with boiling caramel while a wild two year old runs around. So I tried having the caramelizing happen in the oven – and it worked! I also lessened the amount of chocolate on top – it really doesn’t need much, but adjust according to what you like. So I decided to cross my fingers on something I thought might work and it turned out so amazingly that I’m seriously considering not giving it away to anyone at all:) Feel free to leave the salt off the top if it’s not your thing, but I’m a sucker for salted anything and any salty/sweet combo, so I chose to use it liberally. Adapted from this recipe at Frugal Mom and this recipe at baking = love. Preheat your oven to 400 degrees. Get out a baking sheet of some sort that has a lip(not a flat cookie sheet) and line it with tin foil. Grease the foil. Line up your saltine crackers in single rows on the sheet as tightly as possible. Grab a microwave safe bowl/container of some sort and use it to melt two sticks of butter. Once the butter is melted, stir in vanilla and sugar. Pour the butter/sugar mixture evenly over all of the crackers. Place the tray in the oven and cook for about 11 minutes until you can see that all of the mixture has caramelized – look for the caramel color and keep an eye on it at the end. It’ll change to burning quickly, but you don’t want to take it out too early of the mixture will be more sticky than crunchy(but still insanely delicious). CAREFULLY(seriously, you will burn your arms off if you get this on yourself at this point) take it out of the oven and let it sit on the stove for a minute or 3 until the mixture has stopped bubbling and starts to solidify. 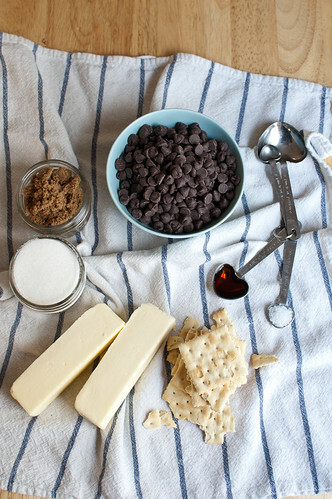 While it’s still hot, sprinkle chocolate chips over the top. Let them sit for a minute to melt a bit, then spread them all over the top. Let it set for a few minutes, then sprinkle with coarse sea sealt – just a bit. 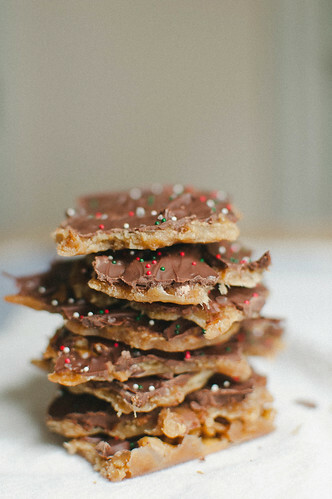 You could also add fun holiday sugars or sprinkles if you feel especially festive, but if you leave it out I guarantee no one will know the difference! Ooooh that looks gorgeous! I’m usually up to my eyeballs in making fudge this time of year, but this looks easy and wonderfully tempting! Bookmarked to try later, definitely!